Jesus spoke this parable to his disciples – a group that were very much discouraged. Having hoped that so many great things would happen with Jesus at their side, they were being overwhelmed with the growing opposition to Jesus. After all, John the Baptist had promised great things would come and it surely must have looked like this promise was coming true. The great crowds that gathered along the way. But slowly, the opposition increased and many began to abandon the following. Hope was turning to disappointment. One clear message from this parable is the fact that such a small seed could turn into a large tree – that something can start from the smallest beginnings and in the end turn into something large…even great. We heard Bo preach on this last Sunday. To me it is clear that Jesus tells his disciples this parable in order for them to understand that even though what was happening may seem small but no person can really know the extent of possible growth. Those disciples had to know that Jesus was talking about them – they were the small beginning that was surely to grow and the growth depended on them. Think about other things that start with small beginnings. Any song, hymn or symphony begins with 8 notes – an octave. The last book you read and its hundreds of pages began with 26 letters of the alphabet. Devotional Thought: Think for a moment about the relatively small number of people who saw and/or heard Jesus and compare to anyone today who uses radio, TV, the internet or social media. In just a short time today, anyone, theoretically, can have their message heard in a matter of hours. When Peter stood up to address those gathered in Jerusalem following the death, resurrection and ascension of Jesus, we are told there were 120 present (Acts 1:15) and in just a short time, following the arrival of the Holy Spirit, we are told “and day by day the Lord added to their number those who were being saved” (Acts 2:47b). From here, the Church has grown to an estimated 2 Billion followers of Jesus today…and how many billions to you think there have been in the past 2000+ years? 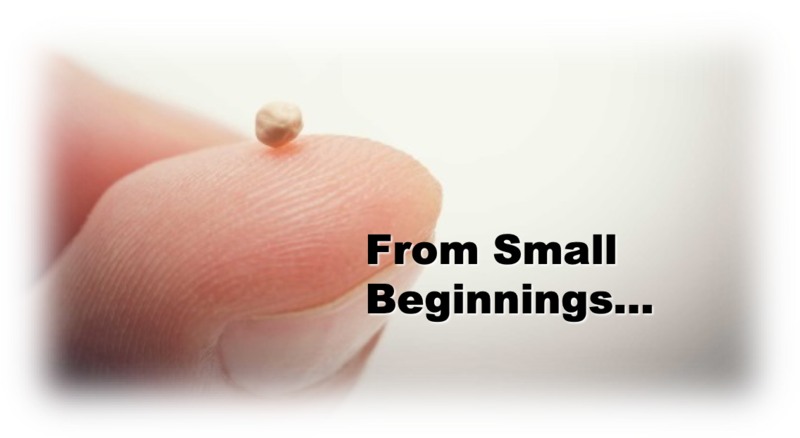 So, if you are discouraged today and finding that hope is hard to come by remember what Jesus told his disciples then and you today – great things can come from small beginnings…especially when God ordains and blesses it!! So, this week I was only supposed to cover Luke 8:5-8, The Parable of the Sower. But just those 3 verses missed out on the explanation of the parable. First, Jesus tells the parable in verses 5-8 about seeds falling in different types of soil and what happens to the seeds after being sown. Then He explains why he speaks in parables; so that only those who are in Jesus’ inner circle will know His message. Then He explains the meaning behind each of the different types of soil. Pretty much straight forward. So my question to you is on what type of soil is the seed being sown for you? My prayer for all who are reading this is that you are the seed being sown in good soil. That the Seed, or Word, is planted in your heart, takes root in your heart, and directs your daily living. There is a great need in this world for people who live out what the Gospels teach. As I have blogged time and time again, our actions speak louder than any words that we may speak. Whoever has ears to listen, may they hear! Jesus on earth, God incarnate, according to Isaiah 53.2 “had no stately form or majesty that we should look at Him, nor appearance that we should be attracted to Him.” Verse 3. “He was despised and forsaken by men, a man of sorrows and acquainted with grief; And like one from whom men hide their face.” Verse 6. “ But the LORD has caused the iniquity of us all to fall on Him.” This was the ministry of Jesus, to take the sins of the world, the very worst we had to offer, including our insults and blasphemies. Excusing our own behavior and accusing Him of not doing enough. This is the expected behavior of the unredeemed, the twisted way of the unsaved, carnal mankind. Now enter the Holy Spirit who has come to be a comforter for redeemed men, a pledge or seal for the regenerated, and a conviction of sin for the unsaved. So in verse 8 of Mark 3 It says, “ Truly I say to you, all sins shall be forgiven the sons of men, and whatever blasphemies they utter; but whoever blasphemes against the Holy Spirit never has forgiveness, but is in danger of everlasting damnation.” The point being that when the Holy Spirit comes to reveal salvation to the individual, all sin will be forgiven at that point to those who believe and receive the Good News, but the one who rejects it will not be forgiven, for that person has regarded the finished work of Christ and the testimony of the Holy Spirit as useless. That one has rejected and blasphemed the Holy Spirit. He is in danger of eternity without Christ, unless he repents and believes, there is no forgiveness afforded him. These people to whom Jesus was teaching and performing healings were infiltrated by scribes from Jerusalem who were saying that Jesus was possessed by unclean spirits, thus they were blaspheming the Holy Spirit, which is the whole point of His statement here. Review: New and old cloth have different properties. New cloth is not worn or been shrunk from washing and drying. Old cloth is “broken in” and it’s size is reduced due washing and drying. Likewise, new wine should not be put into an old wineskin because of the same effects. The old, stretched due to a previous fermentation, is unable to stretch further to accommodate the fermentation of a new wine. If attempted, an old wineskin will bust and fail. Analysis: This parable is one of contrasting properties of the old compared to that of the new. There will always be some incompatibility between them. As the old passes, God brings forward new (Isa. 43:18-19, 48:6). Likewise, those who resist the new from God will wear like an old garment or wineskin (Isa. 50:7-9, 51:7-8). These effects, in part, explain the difficulties Jesus faced in His earthly ministry and any new venture in Christianity, generally speaking. I blogged on the first verse earlier this year. You can read that here. But let’s move onto the next part. “For whatever is hidden is meant to be disclosed, and whatever is concealed is meant to be brought out into the open.” This verse reminds me of Ephesians 5:8-14. I have a hard question for you all this morning: What is your secret sin? We all have one. Sometimes we’re aware of them (impure thoughts, substance abuse, lying) and some sins are more subtle that we may not even recognize it as sin (putting an idol like money before God, pride, ignoring those in need). Exposing a secret sin is hard work. But it’s rewarding work. Remember, Christ came to set us free. This freedom is from ourselves and our sinful ways. If you are caught in a sin, no matter how much worldly pleasure you may derive from it, I bet you feel trapped by it. You could be afraid someone will find out, you could be afraid of being caught, you could be losing values, family time, or even money. Maybe shame from your sin is keeping you trapped. Shame is one of the heaviest shackles. Brothers and sisters, I encourage you to allow that secret sin to come to light. I encourage you to find someone you trust and confess. James 5:16 says, “Confess your sins to each other and pray for each other so that you may be healed.” Confess to God. Repent–turn away. And if you slip up? Confess, repent, repeat. The more you fight this sin that has a hold on you the easier the battle becomes. Surround yourself with believers, bathe yourself in prayer, and allow Christ to shine on you–allow Him to put light in the darkest parts of you. Do you remember planning the reception for your wedding? Looking at all the names of people you have to invite verses the ones you want to invite? And then try to find the best way to sit them around the tables, in a way that makes everyone happy? I do remember that, and if I am to be honest it was a little hellish, let’s leave it at that. As people, we are wired to see others in certain ways, sometimes is based on our upbrigning, or personal experiences and sometimes just based on cultural expectations. Jesus in many ways wants to challange that understanding of who we see and who we honor. For Jesus, there is a new standard at play, in very few words: the least of these. So, who is the least of these today? Who do you see when you interact with those around you? What is the motivation of reaching out to those you meet? Those are some good questions to bring into the conversation, even today when we seem to be divided on so many issues. Christ’s message in many ways goes so much farther than the surface like and dislike button on our facebook page, it goes to the heart and motivation of everything that we are. Today, I pray that you will accept Christ challenge to look at the world through that lens of “the least of these” and open your heart as you welcome the world into your life. Matthew’s image of Judgment Day comes at the close of Jesus’ public ministry. It is also Jesus’ last primary teaching before his death. Such placement must punctuate importance. This last message is a real moment of truth when history ends…When the Son of Man comes in his glory. Predicting the end of the world has been a past time of many over the centuries and here in Matthew, in about 400 words, Jesus provides a glimpse of truth that one day will be fully revealed. A glimpse of truth that there is an eternity of difference in people now and throughout history. But you already know that…right? Look around, listen and watch. All the name calling and gossip. People talking about hating other people in one breath and claiming God is love in another breath. Judging others on outward appearances. Today’s text tells us that this kind of judging is none of our business. It is God’s alone. Judgment is an ugly word today in our world and to be judged is offensive to so many. Many just can’t stomach a day of judgment in the Bible. But, if you read and study this passage – the whole Bible for that matter – I hope you will realize that judgment is about truth. Bringing truth to light about human behavior and the relationships of life. Friends, we know that it is by grace we are saved and it is by grace that we are called to faith. How we live out this faith, has been the teaching of Jesus throughout Matthew. 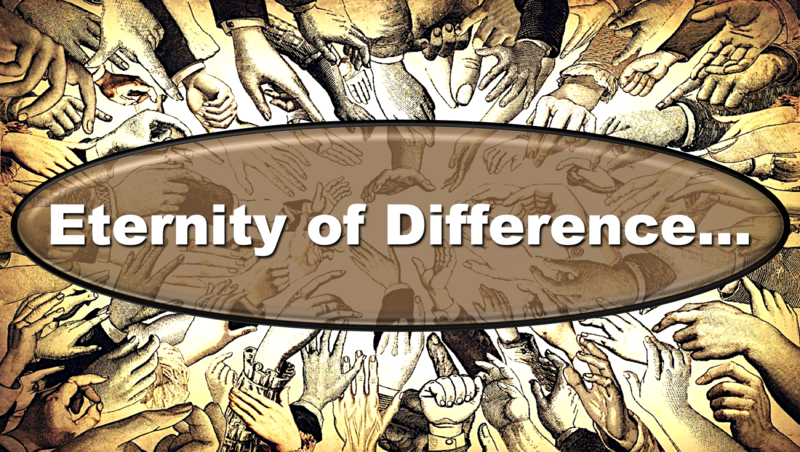 The eternity of difference in people comes down to a clear standard of measurement. One question. The one question today and on that day of judgment deals with how our faith has been lived out. The one question Jesus will ask is this: How did you respond to the need of others? Devotional Thought: In our text today, both the sheep and the goats respond in the same way. Both were unaware of their words and actions in life. Kindness, hospitality, compassion and generosity are not things done for a calculated response – they are a natural and unmotivated response to the need of others out of real faith in Jesus. In this parable, Jesus tells of a master who is going off to be made king. While he is away, he has entrusted a few of his servants with 10 mina each. The master gives them free will to do as they please with the money while he is gone. When he returns, he finds that one servant has doubled his mina, and that servant receives a reward of being put in charge of 10 cities. A second servant has increased his mina by 5, and he is put in charge of 5 cities. But the third servant hides his mina to protect it because he fears his master. Another element of this parable is that there are servants who plot to kill their master, who they think is a cruel leader, and they don’t want him to be king. This parable is a story about what we do with the talents that we are blessed to have. Whether we realize it or not, we all have certain talents. We are called to use those talents in a way that furthers the Kingdom of God. If we use those talents properly, we will be rewarded when the King returns. The king in the parable is Jesus, who goes away from this Earth, but will one day return to judge us by our deeds. The better we use our talents, the more we will do to increase His kingdom, and our reward will be greater. Those who hide away their talents and do nothing for the kingdom will be denied any reward. Finally, the servants plotting to kill their master relates to Judas and the Pharisees who plot to kill Jesus. Or they could just be anyone who speaks evil or plot evil against God and His people in general. The time will come when they will have to face the consequences, which will be a spiritual death. Although there is some doom and gloom in this parable, I’d like to look on the positive side of things. I think…no, I KNOW…that we all have something to bring to the table that can further God’s Kingdom. And it doesn’t have to be fancy, or something that is overly challenging, or involve going on international mission trips. It doesn’t have to involve quoting scripture or preaching a sermon. Of course all of those things ARE important and DO make a difference. But, it can also be simple things like how we have conversations with people on bowling night. Or it could be a smile and handshake or hug for someone who is going through a difficult time. I am a firm believer in our actions speak louder than our words. To say we are Christians and preach the scriptures while being unkind and judgmental is only going to make people who are non-Christians or those on shaky ground in their church life turn further away from The Church. We can’t judge people and throw The Book at people who are already hesitant Christians at best, who maybe were even hurt by a church at some point. We can’t, as Craig preached last week, judge a book by its cover and write them off as not Christians, or remind them of just how non-Christian they are. Instead, we have to just treat them with love and respect, even if they are a prickly cactus. We have a better chance at bringing them to God by still being kind to them. WHICH IS A HARD THING TO DO AT TIMES! But, I believe anyway, as long as we are trying to always be better, we are headed in the right direction. In the marriage custom of the ancient Hebrews, the betrothal was the first binding step. Generally they were arranged marriages, the parents of the bride had arranged with another family for the uniting of the bride and groom, sometimes years in advance. Brides were often fairly young by todays standards, often 14 or 16 years old. The grooms were often much older, having served apprenticeships of 7 to 12 years, or laboring to pay of debts to their own family that took years to accomplish. The betrothal was a binding contract between bride and groom, with vows and ceremony that took a legal divorce to break. After the betrothal a period of time often as much as a year took place to allow for the groom to prepare a home for his bride. This might be a new construction, or an addition on his fathers house as land was scarce and community was strong. Then came the wedding which would amount to a celebration that started at the brides house and ended in the grooms new quarters. It could last for days, when finally everyone was sent home, and the new couple were left alone. Starting with the wedding celebration the bride and her bridesmaids would gather at her parents home and await the groom. A parade was about to start when he came and she and her maids would walk through the streets accumulating other guests in the parade and end up at the grooms for the celebration. These festivities almost always took place at night, so lamps were necessary for lighting the way and identity of those who were invited. Now the word for lamp in this passage is the same as in John 18.3 where the Roman cohort comes to arrest Jesus, the Greek word “lampas,” which is translated torch, not “luchia,” as in Matthew 5.15 which means candlestick. So these girls waiting in the brides home had more of a Tiki light torch, that held oil in a basin or cup, a wick and was on a stick to be held high in the air to light the way. In this parable Jesus tells of ten bridesmaids, who are presumed to be fairly young girls, five were silly, five were prudent. When they gathered at the brides house, five took only their torches with the oil in them, while five more carried an extra vial of oil to replenish their torches as the night wore on. While the groom delayed, for many possible reasons, such as readying the home, party preparations, etc. the night wore on and the girls fell asleep. Verse 6 says at midnight the groom finally arrives! The girls awake, trim their wicks and head out. But the silly ones have no more oil, their torches have burned out and they are unprepared. They try to borrow oil from the prudent ones but the oil is already in the torch basin and there is no removing it now. “Go quickly and see if you can buy some,” is the cry as the parade starts. As they approach the grooms home the party enters and the door is shut. No newcomers are going to be let in now. The other girls come later to the door and beg to come in, saying “Lord, Lord, open up for us,” but the groom says “I don’t know you,” and will not open the door. As in the Sermon on the Mount earlier in Matthew 7.21, Jesus warns, “Not everyone who says to me,’Lord, Lord,’ will enter the kingdom of heaven, but he who does the will of the Father who is in heaven will enter. “ The context of this dissertation is the second coming of the Lord, as Jesus has wept over Jerusalem, and answered the disciples questions concerning the destruction of the temple, when they all thought wrongly about His taking over the physical kingdom of Jerusalem. When they asked, “ when will these things be, what are the signs of your coming, and of the end of the age.” Jesus response was, speaking concisely, read the scriptures, understand the prophets, and be ready. No man knows the day or the hour, so have your soul ready. Don’t think that grace is so free that you can live like there is no tomorrow, and at the last second seek forgiveness, but determine ahead of time what is most important. We are talking about eternity and it’s your soul . Religion is not the answer, good deeds are not the answer, but only faith in the finished work of Christ. He alone has provided the way to forgiveness of sins and eternal life, not Buddha, Mohamed, Hinduism, Joseph Smith, Russel, or Confucius. Just like the parable of the wheat and the tares, the silly and the prudent girls sat together waiting. Only God and the wise ones knew their eternal state, and it’s important to examine yourself, for just like the oil in the torches, salvation is not transferable, I can’t give you mine or vice-versa. Isaiah 55.1 says, “and you who have no money, buy and eat. Come, buy wine and milk without money and without cost.” Salvation is free but must be received.